At a minimum, you’ll need a 3.3V FTDI board and TRRS jack, but I included the jumper wires and shrink wrap for tidiness sake. 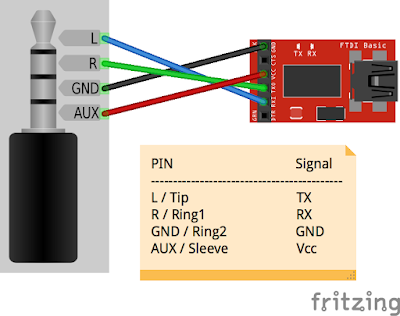 Below is a simple Fritzing diagram that should make everything abundantly clear. Note that the colors of the wires in the TRRS cable do not necessarily match the colors on the digram above (ie. black is most likely not ground). 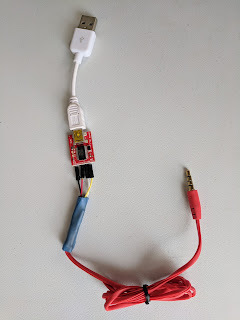 You should check the wires with a multimeter before connecting them to the serial board. You can then connect to the serial console at 115200, 8N1 (with no flow control), though this may depend on the device.